Cricket Wireless is giving away a vacation for two to attend the 2016 BET Awards music concert and show in LA, along with $500 CASH, a Samsung Galaxy smart phone & more! Runner up winners will win electronics prizes like a Smart TV, sound system, furniture for the home's man cave, autographed merch, phones and other great prizes so be sure to get your entry in. 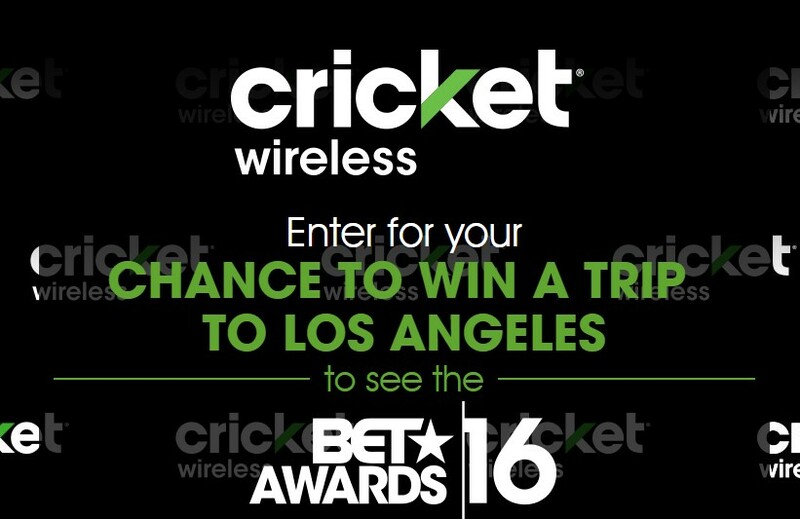 Grand Prize (1): A trip for winner and one (1) guest to the BET Experience scheduled to take place in Los Angeles, CA June 24-26, 2016. Trip consists of roundtrip, coach class air transportation from a major U.S. gateway airport nearest winner’s residence to Los Angeles, CA, 4 days and 3 nights standard hotel accommodations at a hotel selected in BET’s sole discretion (one room based on double occupancy, room and tax only), ground transportation in Los Angeles to/from airport and hotel, two (2) tickets to each of the following events: the Staples Center Concert (“Concert”) on Friday, June 24th and Saturday, June 25th, two (2) tickets to the “BET Awards” on Sunday, June 26th, a hair and make-up/grooming session for winner and guest prior to the “BET Awards”, access for winner and guest to the Cricket Green Room associated with the BET Awards post show, Five Hundred Dollars ($500.00) for winner only awarded in the form of a check, signed Bryson Tiller merchandise, and one (1) Samsung Galaxy S7 smartphone for winner only with one (1) year of Cricket Wireless service with a Pro plan, and a one (1) year Deezer subscription. Approximate Retail Value (“ARV”) of Grand Prize: $7,472.00. First Prizes (2): Each winner will receive a 50” Smart TV, a Giga sound system, and a two (2) piece sofa/loveseat or sectional. Exact make, model and color of Smart TV, sound system and sofa/loveseat or sectional provided will be determined by Sponsor in its sole discretion. ARV of each First Prize: $4,290.96. Second Prizes (5): Each winner will receive a Cricket branded bluetooth speaker and one (1) merchandise item signed by Bryson Tiller. ARV of each Second Prize: $150.